The only ones shocked by Hindenburg Research’s revelations last week that Aphria (TSX:APHA)(NYSE:APHA) was spending shareholder money on assets whose value they inflated all by themselves is the sell-side brokerage houses, who didn’t know that sort of thing was frowned upon. Hindenburg called the Leamington, Ontario based grower a “Shell game with a cannabis business on the side,” on Monday, casting doubt on the value of $280 million worth of Latin American and Caribbean acquisitions that the company orchestrated last quarter, and giving the stink-eye to the $425 million acquisition of Nuuverra that APHA did this past spring in the process. The short side research firm makes a case for a pattern of self-dealing at Aphria, in which management either leaves their personal positions in acquired companies undisclosed, or disclose them quietly, at the last minute. Hindenburg followed up the next day with a deeper look at their thesis in a response to Aphria’s unconvincing denial. It ends up being a fascinating look behind the curtain of the sausage factory, and one that’s long overdue. Hindenburg Research sent APHA on a tumble Monday Dec 3. By Friday, the stock was on the mend thanks to some unexpected help from the cavalry. Licences to grow ditch weed in places nobody from the finance world has ever been (because they don’t want to go there) aren’t worth $280 million, but Aphria isn’t worth the $2-5 billion the market has given it either. No company with $36 million in revenue is worth billions. The firms commissioned to write fairness opinions outlining the value of theses companies are the same firms charged with raising the capital that builds the business. It’s those raises that peg the value of these companies and give the market a starting point. If investors are ready to pay $11.85/share in a bought deal to raise $225 million (and clearing 8% commission plus brokers warrants in the process), who are they to say “no?” And, when that same issuer asks for a “fairness opinion” on an acquisition target from that same brokerage firm, they’re looking for an opinion that… considers the target company’s full potential. This isn’t a new trick. Deals like this infest the resource industry during boom cycles, and various versions of this graft are cornerstones of our modern financial infrastructure. Like a magic-eye illusion. Un-focus your vision a bit and squint… the paper value was there all along. If you can’t spot the sucker, it’s you. The B-Grade mortgage bonds that were re-packaged and sold as AAA debt during the financial crisis went through a similar valuation upgrade, and so do any number of public companies who undergo widespread changes in sentiment. Stocks take off because 50 Cent tweets about them, or because they make firearm detection equipment that wold have been handy at a school that just got shot up. Sudden re-valuations are the foundation of equities speculation. The “innovation” in the board room at Aphria was creating that value jump synthetically by using shareholder money to buy the asset from themselves. Naturally, this is a bad look. The mythos at the core of the legend being sold to growth-focused investors is that management and the board of directors are on their team. Investors are invited to become fellow swashbuckling capitalists who have identified a market inefficiency. Management wants to work with the shareholder, and be their partner in industry! Grow into Titans! Modern Robber Barrons of this new, lucrative sector! Excelsior! 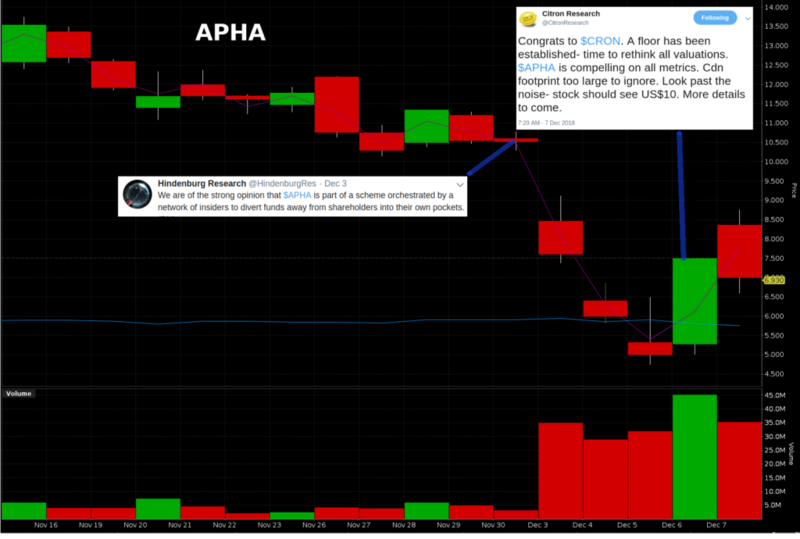 With that particular fairy tale having been debunked, Aphria lost the room, and the street dumped $3.8 billion worth of APHA on the market before the bleeding stopped Thursday. The task now is figuring out what’s left over, and what it’s worth. Before they were synonymous with… creative wealth transfer, Aphria’s claim to fame was that they were tight. The reporting was meticulous and and they were the first of the major Canadian shops to report a cash-positive quarter. 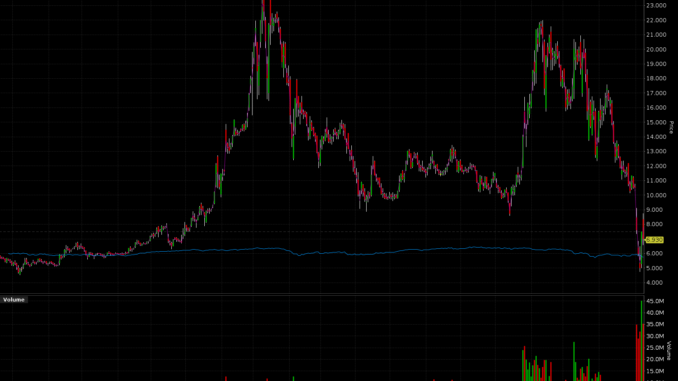 APHA was never worth what the market gave them, but none of it’s peers ever were either. The APHA value ascribed to the Latin American & Caribbean assets was something of a draft effect off of Canopy’s Latin American deal, done earlier this year. It isn’t a producing entity and didn’t warrant consideration as part of APHA’s valuation then, and it’s certainly not part of it now. The value here is in Canadian Ops. In what feels increasingly like a minority position, I remain convinced that the best measure of a weed growing business in the growth stage is the amount of sellable weed they grow, and how much the amount of weed they grow grows. 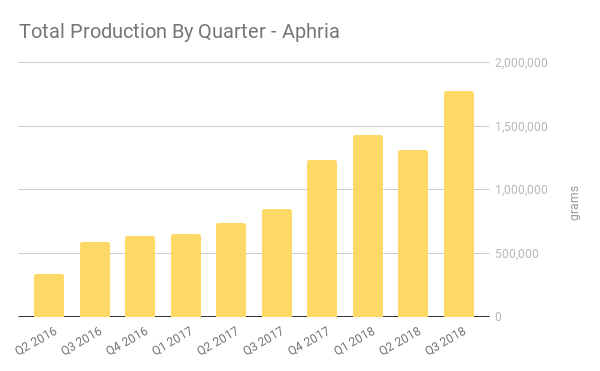 Aphria had their first quarter of unit recession in the spring, but made up for it in the summer. 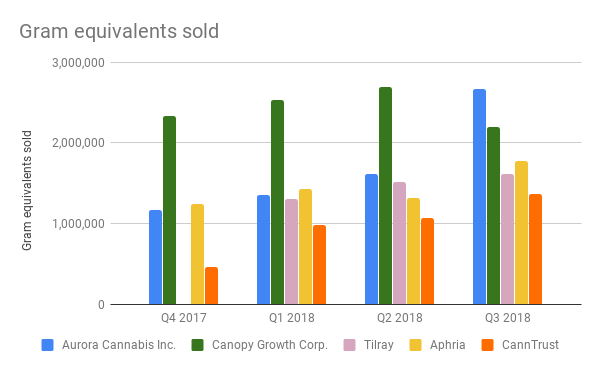 We’ve grouped them with the other million-gram-plus producers to see how they’re going (Note: Aphria’s odd year-end has them reporting a month ahead of everyone else charted here. Q1 ends Feb., Q2 ends May, etc.). So far, APH is showing good, consistent production, and production that beats $11 B Tilray. Their unit growth has only receded in one quarter. But we’re ahead of ourselves. 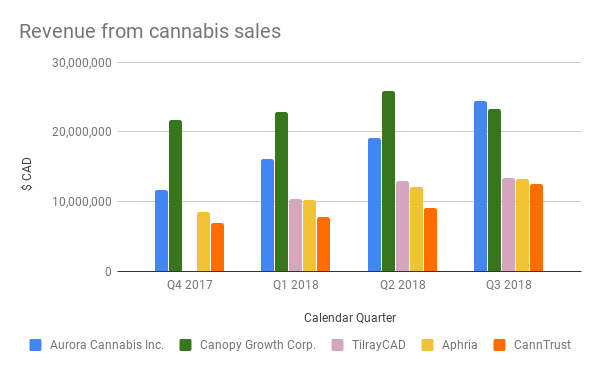 This next quarter will be the first one in which these companies publish sales numbers that were exposed to Canada’s legal rec market. 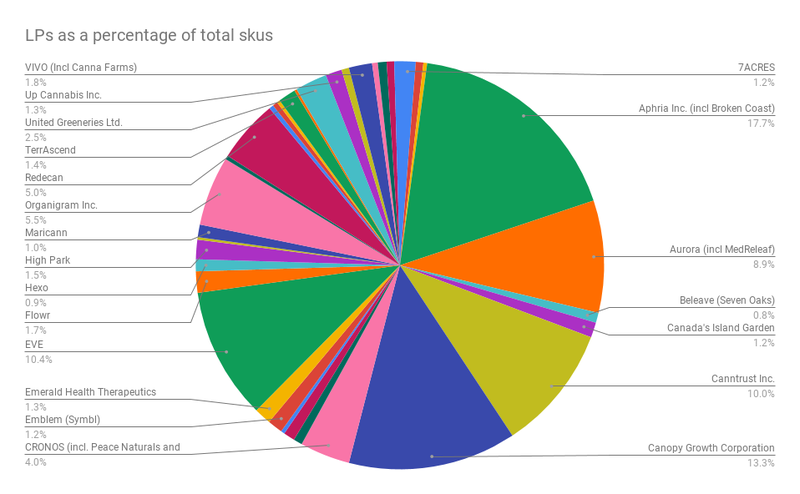 Our analysis of the war for shelf space had Aphria holding 17% of both in-stock SKUs and total SKUs. 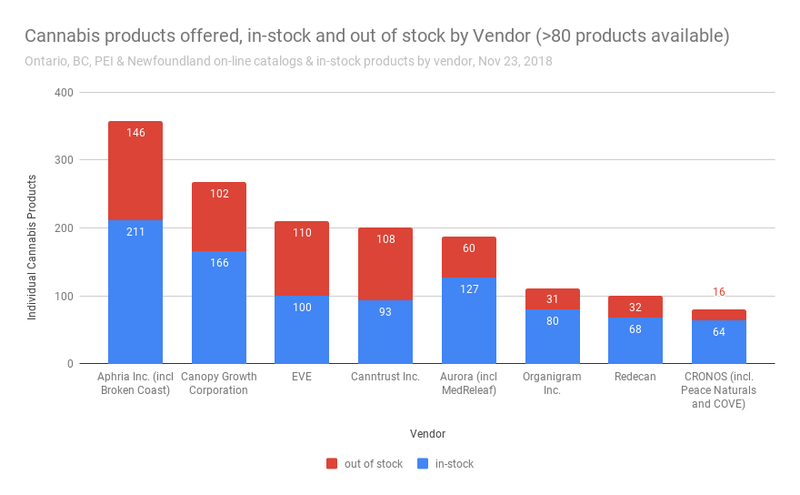 Data that we collected from provincial web portals on November 23rd had Aphria with the highest number of unique brands, and the most in-stock brands. It’s too early to tell whether or not those products are in stock because smokers don’t want them, but stay tuned for future data scrapes that might give us an idea about product turnover and changes in market share. For now, Aphria is supplying the Canadian retail market at a decent pace. They’re going to be our first look at how the retail market effected the LPs’ revenue when they report their November quarter. Here’s their sales revenue in relation to their peers. 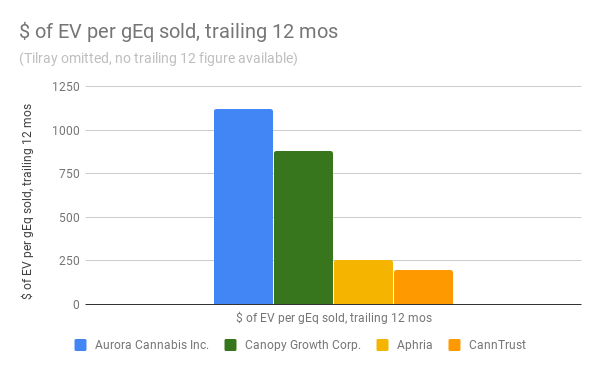 Of the companies charted here, only Aphria and Canntrust have been able to come up with a profitable quarter (Aurora had one last quarter, but that was by virtue of a re-classification of their TGOD paper, so we aren’t going to count it). If all we’re evaluating is operating capacity, Aphria looks pretty cheap on an enterprise value / unit sales basis. As far as bad press goes, that Hindenburg report made up for lost time. The Canadian financial media’s treatment of Aphria has been so kind that it lent itself to the parody of under-rated Youtube Cannabis stock phenom Bacon_is_Bad, who we hope makes another Aphria video soon. Both web-based financial media like The Midas Letter and Grizzle and legacy media like the Post and the Globe have been very kind to Aphria, and none of them bothered to look under their fingernails the way Hindenburg did. We don’t expect them to start any time soon. Grizzle maintains Aphria as a “conviction call,” and hasn’t updated a $40 – $200 target price that they gave APHA in a November 1st report. …and they aren’t alone. Aphria bounced off a bottom on Friday after the notorious Citron Research tweeted that they saw upside value in Aphria, teasing more to come later. This company has its fans and is undeniably able to produce cannabis from their operating facilities. Citron’s assessment of $10 APHA doesn’t appear to take into account the production potential from the mammoth 1.3 million square foot “Aphria Diamond” facility currently under construction, and nor should it. Twitter user Nhat Doan shared a gallery of pictures purporting to be from the under-construction facility on Friday. It certainly is big, and we can’t say for sure without an expert opinion, but it doesn’t look like the kind of thing that just gets staffed and run correctly in one go. We maintain that it’s foolish to count facilities as commercial producers before they’re producing commercially. The trust that helped APHA become a market darling can return with a change in management. 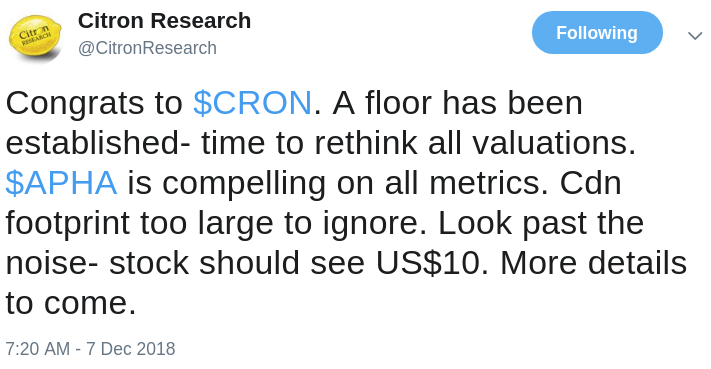 Citron’s $10 call sounds about right, and we expect Aphria to move sideways in this range as long as this team stay aboard. As long as Aphria continues to gain shelf space in Canada and fill it with quality product, and maintains a strong fiscal structure, they’re going to put themselves in line for the one thing these cannabis producers and the street that finances them really want: a shot at the US market. Teases about Big US liquor and tobacco being interested aren’t going to fly anymore. Not with this crew running the ship. But if a federal law change does open the US up, look for Aphria to create value in proportion of the section of the market they’re able to give themselves a reasonable shot at. Video parodies of James West’s interviews with Vic Neufeld courtesy youtuber Bacon_is_Bad, who should really post more often. All charts and graphs compiled by Fundamental Hype. There’s more where that came from, so subscribe.